DAY 5 continued: A wonderful afternoon – lots of children, sunshine and a very important empty field.Our time on the hill was followed with an afternoon in an empty field. It was a delightfully empty field. 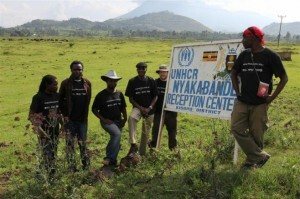 The purpose of the field is as a UN evacuation and refugee centre if there are troubles in Rwanda or the Congo. The fact that it has no tents, has no refugees, is a wonderful thing and we felt it was a great location to record Kanyabukunga Twifatanye (‘Togetherness Group”) from the village of Kanyabukunga. They are led by Gadensia Kampire. The SWP crew poses next to the road sign with the empty field behind. Soon, however, the area was filled with lovely children, here to watch some wonderful dancing and singing. As we unload the vans, the ‘Togetherness’ group are waiting to greet us on the ‘stage’….. 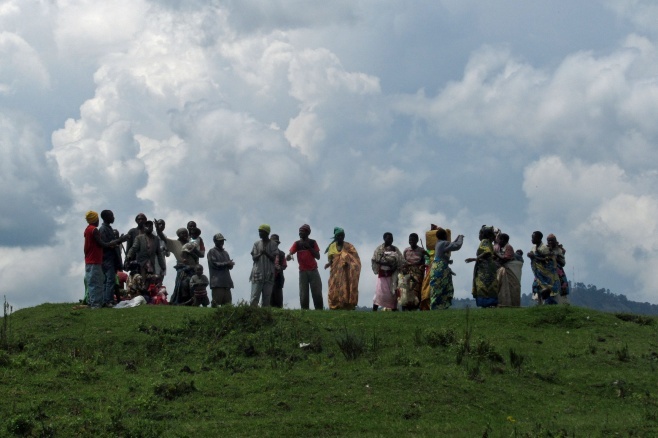 The performance is fantastic… here the group are singing ‘Waratsinze Sikota’ in praise of God, but lamenting that the Batwa people had lived in the forest under grass huts, but now live near the streets under tin roofs…. The crew worked hard in the blazing sun – getting close to the action to make sure we captured the energy of each vigorous tribal dance. 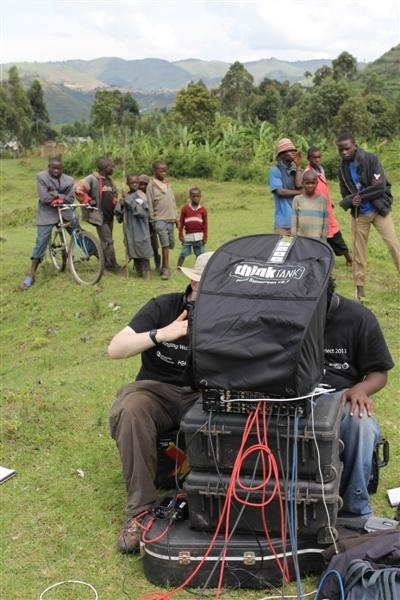 While the audio team for the day, Andy and Willie, deploy the essential sun shield for the mixing desk. They also found an additional use for the Pelicases, and Winyo’s guitar case, as mixing table and chairs! And here’s a very special young lady from this community – Fiona Nyiraguhirwa. 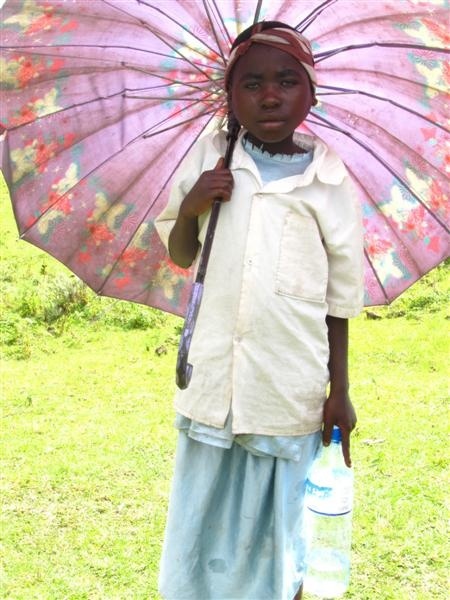 Fiona has been sponsored by UOBDU through Junior School. Everyone is hoping she will be able to continue her education into High School and beyond. 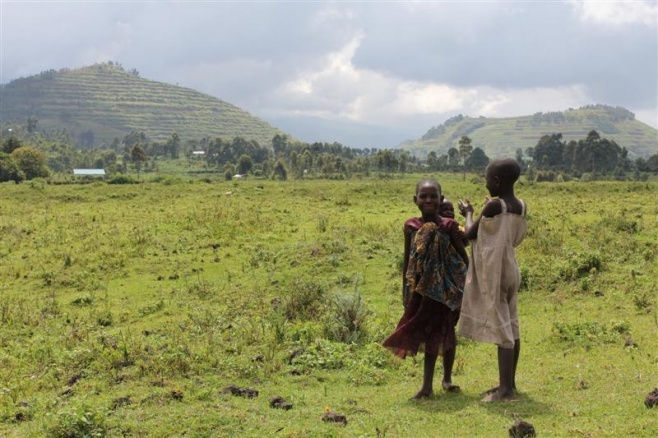 She is a wonderful role model for the Batwa and is proving how, with the right opportunity, Batwa children can achieve the same educational goals as any other child. 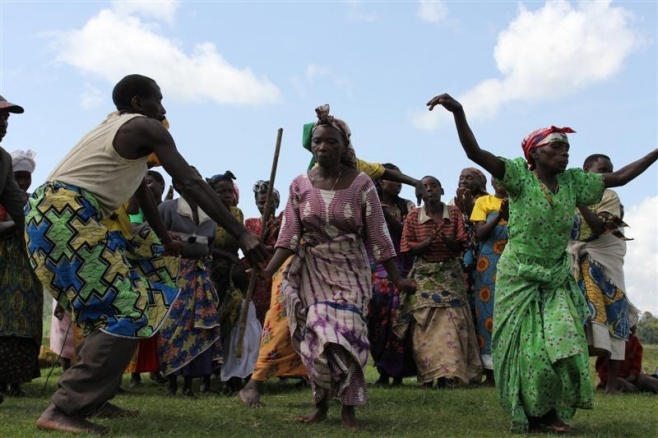 Here are the videos which include a Batwa song called ‘Abagyeni Beza’ which is in praise of visitors to the community, telling them that they are beautiful. A lovely song for us to hear! The afternoon session wraps up at about 5pm. We say our farewells and head back to the Traveller’s Rest for the evening recording session.